Stillwater, MN—Transform mundane utility boxes into public art? That’s a Great Idea! 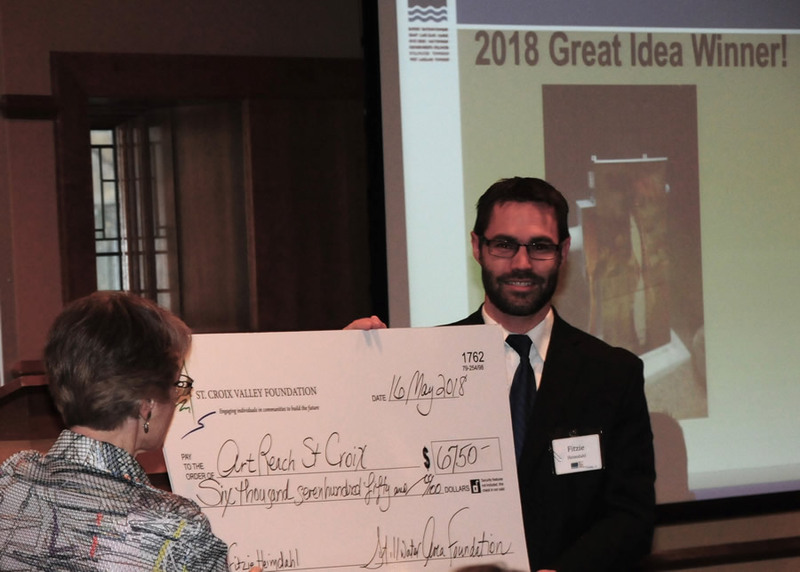 Marine on St. Croix resident Fitzie Heimdahl is the winner of Stillwater Area Community Foundation’s sixth annual Great Idea Competition. Heimdahl will receive a grant to launch the Power of the St. Croix Utility Box Mural Project. The award was presented at the community foundation’s annual reception and fundraiser at the Lake Elmo Inn Event Center on May 16. Each year, Stillwater Area Community Foundation accepts applications from local individuals, businesses, nonprofits and other groups who have an idea that will benefit our local communities, and who have the determination and ability to put it into action. Heimdahl’s winning Great Idea focuses on transforming plain, unsightly utility boxes into beautiful works of art. The majority of the $6,750 grant funds will go towards the commissioning of original art from local artists, centered around the theme of the St. Croix River, to be applied to selected utility boxes. Ten of the covered boxes will be located within Lowell Park in Stillwater and 13 boxes will be within the city of Marine on St. Croix. Both cities have committed to co-funding the project. According to Heimdahl, several cities across the country have completed similar projects to beautify and enliven their downtowns. He has previously worked with Menomonie, WI, and Minneapolis to introduce the concept. Cities and taxpayers stand to benefit, too. Similar projects have proven to reduce graffiti and tagging on utility boxes, and the process used to apply the art will make it easier to clean and remove any graffiti that may occur in the future. Artists who want to participate by creating a work of art for a utility box are invited to apply through ArtReach St. Croix (ArtReachStCroix.org/opportunities). 2018 Great Idea Competition winner Fitzie Heimdahl receives the award from Stillwater Area Community Foundation board chair Miriam Simmons. Shown is an example concept for the Power of the St. Croix Utility Box Mural Project, Stillwater Area Community Foundation’s 2018 Great Idea Competition winner. The award-winning project was submitted by Fitzie Heimdahl (artistic concept by Tom Maakestad). Artists who would like to participate in the project by creating utility box art can apply through ArtReach St. Croix (ArtReachStCroix.org/Opportunities).